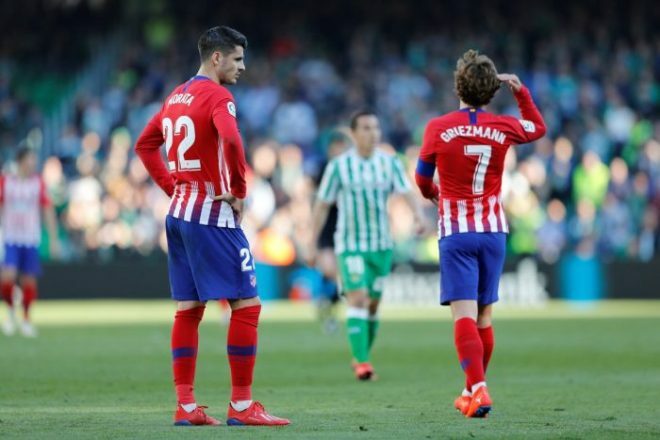 Atletico Madrid fell to their first La Liga defeat in five months as they were beaten 1-0 at Real Betis on Sunday. 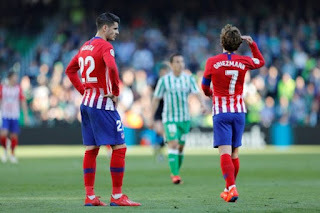 The capital city side therefore missed a golden chance to close the gap with leaders Barcelona and slipping six points adrift of the Catalans. Alvaro Morata made his debut for Atletico after completing a loan move from Chelsea, but it was another former Real Madrid player in Sergio Canales who made the difference. He scored a penalty midway through the second half to give Betis a victory which took them up to sixth in the table. Atletico coach Diego Simeone was without five regular starters but was still able to field what looked to be an exciting, attacking lineup. Pacey wingers Angel Correa and Thomas Lemar partnered Morata and the talismanic Antoine Griezmann up front. Barca’s 2-2 draw with Valencia a day earlier had given Atletico the opportunity to move within three points of their title rivals yet they struggled to get a hold on the game. It took a spectacular save from Jan Oblak to prevent Zouhair Feddal heading Betis in front midway through the first half. Filipe Luis gave away the penalty which decided the game, striking the ball with his left arm as he attempted to chest it down. And although Oblak dived the right way, Canales’ spot-kick was too powerful for the Slovenian to reach. Barca lead the standings on 50 points after 22 games, Atletico are second with 44 while third-placed Real Madrid. Madrid, who will play at home to Alaves later on Sunday and visit Atletico next week, have 39 points. Atletico had a penalty appeal of their own late in the game when Morata went down under a challenge from Feddal. Griezmann also went closest to scoring for the visitors when he hit the post after the interval.